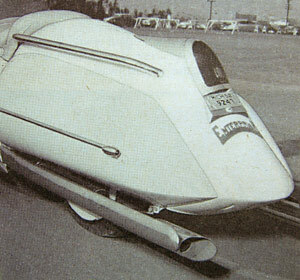 Harvested from Popular Science – March, 1953. One night in March, 1950, O. Ray Courtney worked until two a.m. and drove home discouraged. 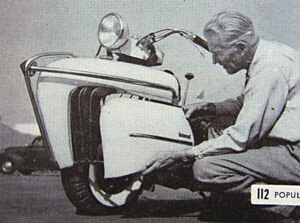 He was trying to design a better motorcycle. He wanted one with the seat forward, with better cooling, better springing and a more beautiful body. Discarded sketches littered the floor of his shop. That night in a dream he saw a steamlined beauty skim across a flowered field. 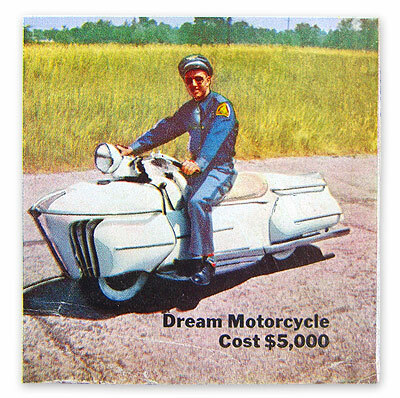 Too excited to report for work the next day, he hastily put his dream on paper – and he is riding that dream cycle now through the streets of Pontiac, Mich.
Vespa or Lambretta? That’s been the conversation in my head lately, as I consider taking on an old scooter project. But none of that matters now that I have seen the 1950 Courtney Enterprise. I would have a tough time settling for anything less than a custom mega-scoot! FRAME is 1 1/8 inch chrome-steel tubing. Handlebars, 10 1/2 inches forward on an extenstion tube, are mounted on a second head. They connect through drag links to the fork. STREAMLINING continues to tail. Machine is 26 inches wide. Bulges flanking sides of rear wheel are metal-covered saddlebags. 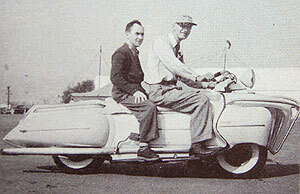 TWO CAN RIDE comfortably on the big seat. Long footboards add to the comfort, and prevent splashing. The Enterprise is 112 inches long and weighs 580 pounds. Everybody run out and check you grandpa’s barn right now! This bike must still exist. It seems unimaginable that something like this would ever get junked. This entry was posted on Tuesday, April 25th, 2006 at 9:20 pm	and is filed under Automotive. You can follow any responses to this entry through the RSS 2.0 feed. Both comments and pings are currently closed. if your original quandry is still troubling you, here’s your answer.. and it’s painful for me to say this.. I’ve been a devoted Lambrettista for more than 10 years and have long argued it’s advantages (streamlined! mid-mounted engined = perfect balance! more powerful! etc. )..
but as my (admittedly slow) 3 year restoration of my LI150 lammy was nearly complete, my wife picked up a ’65 Vespa.. the thing is so ridiculously easy to work on.. and has so few pieces.. it’s definitely the easier route into scootering..
Coddington’s bike looks like a Pisticio colored Bat Cycle. I agree, the Enterprise is too cool. I hope it does still exist somewhere. I wonder if you’ve heard fo the Defiant scooter. It’s a frame you can buy and put an engine into. I think they based it on a Harley softtail but there was talk of using different engines. It makes a very big, very fast, scooter and you can then put on a body of your own making. well i dont cair much except man do i want one. some such fullsize bike for the rest of us. Very interesting. I recognize the powerplant as some model of Indian, I’ve no idea of which model. Very much ahead of the time is the long travel rear swing arm suspension. Most bikes were still short travel rears, most being plunger. It also looks like he used a center-hub to pivot the front wheel left to right, another design that even today is only used on a few exotic bikes. Maybe Jay Leno have one. THIS MOTORCYCLE WAS DISPLAYED AT THE HARD ROCK CAFE AT UNIVERSAL STUDIOS A FEW TEARS AGO. IT HADD A DUMMY SANTA CLAUS SITTING ON THE SADDLE. Ray Courtney was my grandfather and I remember the Enterprise well; when I was a little girl I begged him to promise me that when I was old enough, I could ride it. It definitely was on display at the hard rock in Orlando Florida. it was green and white and I actually took a photo of it because I had never seen one before. It looked too professionally built to be a home built “special”. A fascinating machine of its time—though there was a similar machine built in Germany between the wars. Ray was my grandfather,I had the privlige of riding the ENTERPRISE as a teen in tha early 60′s. The bike was changed in the late 50′s with built in saddle bags on each side of the rear wheel house, adding room for longer rides no matter what the wheather was. The HARD ROCK has a few wharehouses and one of them has the ENTERPRISE that was to be in a movie is stored in one of them. I have not been able to get a reply from them. I know it still exist due to a HISTORY documentry TV.The other 2 are stored with the family. BSA and INDIAN engines where used in them. I wish he was still around to see how many of his patiants of the bike are now used on other bikes built today.He was ahead of his times. Thanks for the update! I am really glad to hear that the bike is still around. Actually your right Nixmom. i remember seing a body like this on ebay for sale a few years ago, i remember it cause i was doing some research on this dreamcycle after i seen it on ebay. i remember it mentioning that the power plant was Indian in fact as you mentioned. If one or both of you would contact me, I would like to talk with you or any family members that may know about some of the work your grandfather did while at Kaiser Frazer. I know he designed body parts while there, as his name come up during some research I am doing on a vehicle that came out of the Kaiser Frazer plant in Michigan. I’m trying to idenitfy who designed the vehicle and what the intended purpose was so that it can be completed. Any information or help (positive or confirmed “NO, it isn’t his work”) would be a help.